Ligne size 11.5, height 3.00 mm, hand sizes 70/120/20. date at 3, Swiss Made. Solid 100% Stainless Steel Sanded Finish Case with Crown Protection. Case comes with crown and tough 1.30 mm thick mineral glass crystal will not easily scratch or break. Case Diameter is the same as style number 1 case, which is 35 mm. The height is at 8.7 mm and 18 mm lug width. The Crown (#768/10W) diameter is 3.5 mm, case diameter is 2.0 mm and the crown protected recess space is 4.0 mm It you need a dial to fit Ronda 515 quartz movements please see the link at the bottom of the page. Ideal for use with Ronda 515 a 11 1/2 Ligne Movement. This case comes with a plastic movement ring to hold the Ronda Cal 515 11 1/2 ligne movements. Takes dials which have diameters 28 to 28.5 mm. 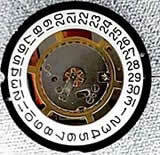 Dial opening is 26.0 mm. Choose from the dials we have by clicking on the link at the bottom of the page. 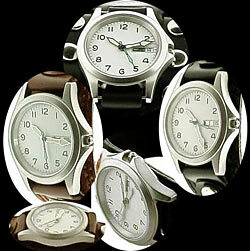 Use Ronda Cal 515 quartz movements with hand hole sizes 70/120/20. Flat 1.3 mm thick Sapphire Glass Crystal, Solid 100% Stainless Steel 316LS Sanded Finish Case with Crown Protection. 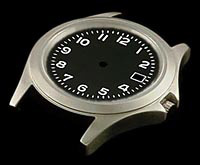 Dial opening is 26.0 mm. 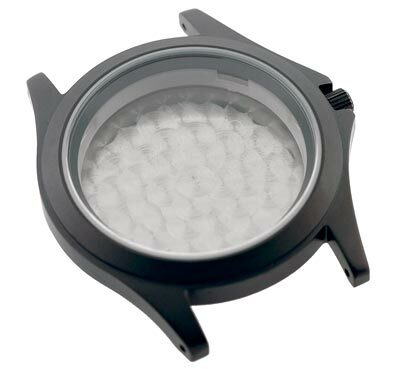 Crown (#768/10W) diameter is 3.5 mm, crown tube diameter 2.0 and the crown protected recess space is 4.0 mm.